Why do I live in a Freezer? There is nothing worse than waking up in the morning to find the air in your room is sub zero. Yes my furnace still works, but is feels like sub zero. The outside temperature with windchill here in Sunny Iceblock Edmonton is -37C. Today is the warm day of the week…-40C is a coming! As I kid I lived on the shores of Great Slave Lake in the North West Territories Canada. That for those of you not in the know…is the Arctic. It was a place where it was dark all the freakin time, cars wouldn’t start because it was too cold, the oven door was often open and used as the fireplace to heat the kitchen. The wind off the lake would yield temperatures like -65F. It would warm up to -35F and feel like spring…no joke. That kind of temperature differential is huge. It’s mornings like this one where I have to force myself to remember what Yellowknife and Hayriver felt like. It makes Edmonton feel like the Bahamas. Well…not true, it makes Edmonton feel like Central Alberta not the Arctic. I am off to work this week where I will meet families who have never been this cold before. They are from places like Africa, Pakistan, India, and Philippines where this kind of cold makes them think they are dying because the air from their mouth is frozen. They don’t understand how it is possible for it to be so cold and have the sun shine. We will reasure them their lungs are okay, remind them to wear mitts and hats. Snowpants are a good idea as well as a sweater under your coat. I will ask them WHY they chose Canada because it is nuts to move to a place that gets this cold. The upside of Cold like this? Bugs don’t get very big and dies off…. no poisonous spiders here! Snow sparkles in the sunshine. Soup tastes better. Hot coffee feels better in your hands before you let it slide down your throat. Your bed is so cozy you can’t wait to hop into it with your warm jammies and a great book. Avoid the Mexican gang wars, retire in Texas! It’s a balmy 64F this morning. (Above zero!) You can still be in Texas and enjoy warm sandy beaches in South Padre Island, right next to Mexico. I do miss Tim’s tho. Remember to bring a supply of coffee, chocolate bars and ketchup chips (and/or dill pickle). I actually get more acomplished in the winter than the summer. Summer is about being lazy and enjoying the sunshine hahaha. Left San Diego, 25C arrived Yellowknife -55C with windchill, I need to use scientific notation. Remember this day when you are sweating your brains out trying to sleep in 30C house next summer. 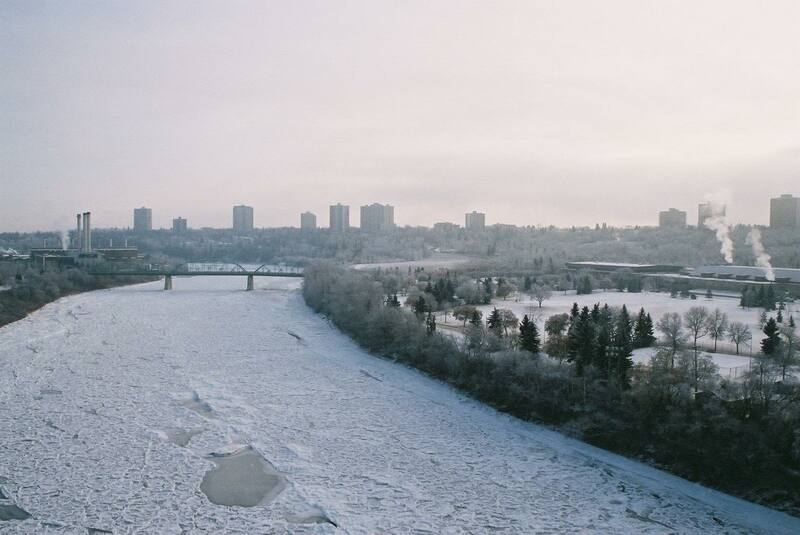 lovley shot of edmonton your here because we think it is the lpace on at lease to me and i have been to lots of place and to me it is still the best and the cold will go away so have your hot coffe as gramps used to say this to will past g.g. And it wasn’t pleasant?! Lol! I agree, go find someplace warm for the winter. Then I can visit….!!! Just by myself tho. I always like a good Winter, and a great photo you have. That is one of the best photos showing Edmonton I have seen.